Brick Crete ( Brickcrete) is base on a new concept that is visually and structurally an improvement on any other precast walling fence product in its class at a very competitive and affordable price. Please see our precast concrete walls price list. The mission and aim of Brickcrete concrete wailing, is to provide our clients with the best quality and service available, in the vibracrete fencing field. Walls are under a 2 year guarantee. Adds value and warmth to your home, available in beige, tan, multi or plum colours. Our concrete walls are reinforced with steel. 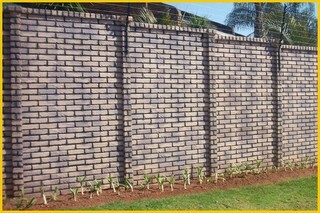 Brickcrete precast walling is at 50% cost of normal brick walls. Two oxides is blended to achieve this unique multi colour clinker colour precast wall appeal. The unique texture and colour of these fences accentuates their beauty and the beauty surrounding them. The look of this concrete fence can be crowned with an attractive capping and rail. Multi Colour reflects the colour and characteristics of real brick while incorporating the durability of precast concrete wall.